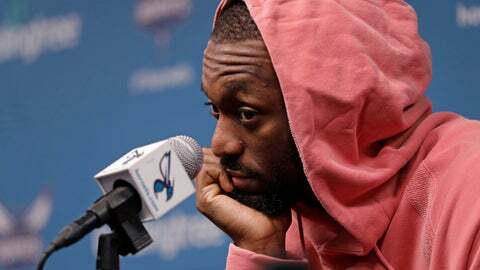 CHARLOTTE, N.C. (AP) — There’s a part of Kemba Walker that wants to play his entire career with the Charlotte Hornets. There’s another part that wants to compete for an NBA championship before he’s too old. And he’s just not ready to do that just yet. He’s coming off his most productive season statistically, averaging a career-high 25.6 points per game to go along with 5.9 assists and 4.4 rebounds. He was selected as an All-Star game starter for the first time and has put himself in the running for the All-NBA team. Walker’s dilemma is that if the Hornets re-sign him to a max contract, they won’t have many pieces to put around him — which means the team could continue to muddle in mediocrity as they’ve done for the first eight seasons in Charlotte. The Hornets have only been to the postseason twice during that time and have never gotten out of the first round. “I mean, obviously I do want to be competitive because I want to be able to play in the playoffs,” Walker said. “So, I want to think that would have some influence” on my decision. At media day last September an excited Walker sounded committed to re-signing with the Hornets, saying he “wanted to create something” in Charlotte. Walker said Thursday that “nothing has changed” in that regard, but his enthusiasm has clearly waned over the past seven months. Nic Batum has two years left on a whopping five-year, $120 million contract, yet he readily says he “doesn’t know” what role he’ll play next season with the Hornets. That’s a lot of money to pay a reserve, but the Frenchman’s numbers have dropped significantly from the 2016-17 season with his scoring dropping from 15.1 points per game to 9.3, his assists falling from 5.3 to 3.3 and his rebounds from 6.2 to 5.2. “It was a different year for me — different roles, different positions,” Batum said. Tony Parker said he’s “50-50” on whether or not he will return for a 19th NBA season after his streak of 17 straight playoff appearances was snapped. In other contract news, forward Marvin Williams said he won’t opt out of his contract. But Michael Kidd-Gilchrist, the former No. 2 overall pick in the draft, remains undecided on whether he will exercise his player option next season of $13 million. Likewise, center Bismack Biyombo remains undecided on if he’ll opt out of his deal.